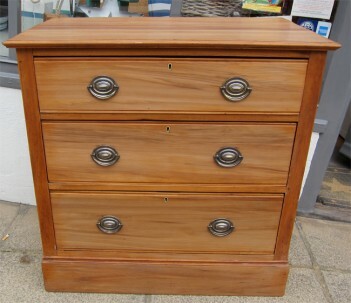 Edwardian (1900-1910) Satinwood 3 drawer chest of drawers. Lovely quality, this has been fully refurbished, repolished and waxed. New period style handles have been added. Please click on the photos to see larger images. One of the photos also shows the unit before the work was undertaken to transform it into the lovely item it now is!